So what happens when one of the greatest rock bands on the planet has their biography written by one of the foremost music journalists of our time? The answer is this superb tome, a true celebration of AC/DC and their influence and impact on the rock genre. Sutcliffe has gone back to the very roots of the band, including previous, long-forgotten outfits where Angus and Malcolm cut their teeth in Australian bars, and taken it right through to the present, where the band are still selling out mega-stadiums with ease. Some incredible highs and some deep lows, such as the death of vocalist Bon Scott by alcohol poisoning in 1980, are handled with a deft touch by the author, which make this an excellent read. 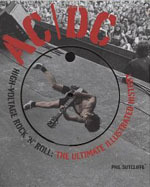 Another aspect which has been handled well is the layout of the book, which is packed with many rare pictures of the band, both on-stage with all the excitement of an AC/DC live performance, and behind the scenes which show a rather more mellow side, that despite their hard-drinking, hard partying image, they appear to be an affable, approachable bunch of blokes. In particular, a photograph taken at the auditions for Bon Scott's replacement shows a band at an emotional crossroads, almost waiting for someone to drag them up off the floor. Add to this many images of album and single sleeves, tickets, posters, badges, t-shirts and backstage passes, and the book starts to feel like your own scrapbook. There are many quotes from rock icons such as Jimmy Page, Billy Gibbons, Steve Vai, Joe Perry and Alice Cooper that illustrate just how highly the band are venerated among rock's hierarchy. Add to this an in-depth analysis, by various music journalists, of each of AC/DC's albums, together with full recording details and every worldwide variation of sleeve artwork, and you start to get an idea how comprehensive this work is. Whether you are a fan of the band or not, this makes for a wonderful reading experience, and a real insight into the way a top rock band goes about climbing the rock pyramid from bar-room to stadium - and all this without a single appearance on the X-Factor. Who'd have thought it, eh?